Just rolling the name “Wakatobi” off your tongue evokes a remote, exotic locale and this resort/national park certainly lives up to that billing. Located off the southeastern tip of Sulawesi, Wakatobi is actually an acronym for an area that includes four different reef-rich islands. CTA recently led a private trip to this magical area and everyone returned from the trip raving about the shallow reef life that flourishes there. Providing consistent views of vast, verdant coralscapes to an uber-rare sighting of a minuscule Pohtoh’s pygmy seahorse, the many snorkeling sites that surround Wakatobi Dive Resort did not disappoint. Many of CTA’s snorkeling trips are based on luxurious liveaboards that allow coverage of a large areas but Wakatobi is one of the few resorts where various snorkeling sites abound within just minutes of the dock. 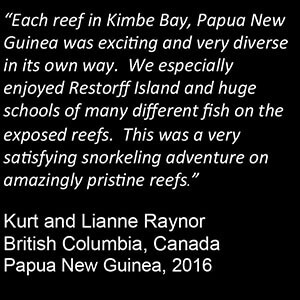 The reef fish diversity throughout these sites is unbelievable. We were able to closely observe moray eels, Ribbon eels, several different scorpionfish species, dartfish species, spadefish, boxfish, puffers, eight anemonefish species, countless butterflyfishes and angelfishes, groupers, and the list goes on and on and on. Notably, the waters of this region are not heavily fished and thus the grouper populations are the healthiest we have seen anywhere in the Pacific. Though we did observe some coral bleaching in the shallows due to high sea surface temperatures that had recently occurred very little mortality had occurred. Water temperatures were already dropping back to normal (~83° F) while our trip was happening and thus most corals were going to eventually reacquire their symbiotic zooxanthellae. Taken as a whole, Wakatobi is one of those perfect destinations for groups of snorkelers where luxurious accommodations coincide with excellent visibility and ridiculously beautiful coral reefs. CTA is already thinking about when we can revisit this incredible destination and further explore the shallow marine habitats that thrive there.